The more a man regards everything as divine—the more God will be pleased with him. To be sure this requires effort and love, a careful cultivation of the spiritual life and a watchful, honest, active oversight of all one’s mental attitudes towards things and people. It is not to be learned by world-flight, running away from things, turning solitary and going apart from the world. One must learn an inner solitude. He must learn to penetrate things and find God there, to get a strong impression of God fixed firmly on his mind. So work, says the Vedanta, putting God in everything, and knowing Him to be in everything. Work incessantly, holding life as something deified, as God Himself, and knowing that this is all we have to do, this is all we should ask for. God is in everything, where else shall we go to find Him? He is already in every work, in every thought, in every feeling. Thus knowing, we must work — this is the only way, there is no other. Thus the effects of work will not bind us. We have seen how false desires are the cause of all the misery and evil we suffer, but when they are thus deified, purified, through God, they bring no evil, they bring no misery. Those who have not learnt this secret will have to live in a demoniacal world until they discover it. Many do not know what an infinite mine of bliss is in them, around them, everywhere; they have not yet discovered it. It is thought which is the propelling force in us. Fill the mind with the highest thoughts, hear them day after day, think them month after month. Never mind failures; they are quite natural, they are the beauty of life, these failures. What would life be without them? It would not be worth having if it were not for struggles. Where would be the poetry of life? Never mind the struggles, the mistakes. I never heard a cow tell a lie, but it is only a cow — never a man. So never mind these failures, these little backslidings; hold the ideal a thousand times, and if you fail a thousand times, make the attempt once more. The ideal of man is to see God in everything. But if you cannot see Him in everything, see Him in one thing, in that thing which you like best, and then see Him in another. So on you can go. There is infinite life before the soul. Take your time and you will achieve your end. 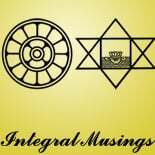 This entry was posted on November 27, 2012 by integralmusings in Words of the Masters.